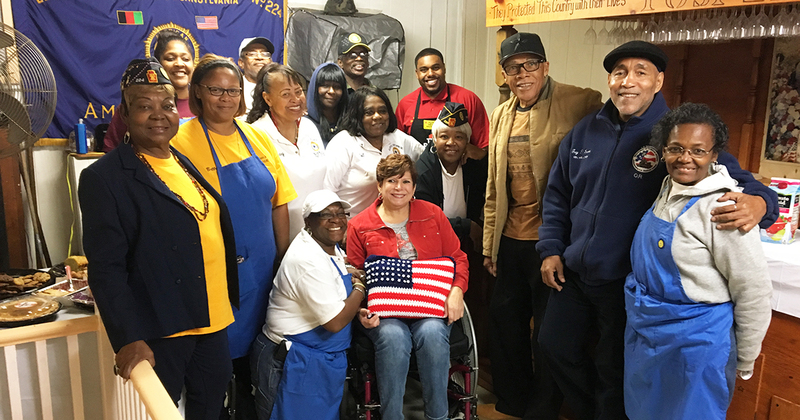 PHILADELPHIA, PA, November 11, 2017 – Omelets, waffles and an extraordinary funding announcement were all on the menu when state Sen. Christine M. Tartaglione and state Rep. Jason Dawkins cooked breakfast for the members of Lloyd C. Wilson Jr. Memorial American Legion Post 224 on Veterans Day. The lawmakers revealed that they had successfully obtained a $1 million allocation for physical improvements to the post as part of Pennsylvania’s recently enacted capital budget for fiscal year 2017-18. The allocation will be tied to $1 million in matching funds that must be obtained from other sources. Tartaglione and Dawkins are confident that one or more private-sector organizations will contribute to the worthy cause. “The first step has already passed the legislature. The governor has signed it. It’s allocated for Post 224,” Dawkins said. Founded in 1987, the post is home to about 50 American Legion members representing all five U.S. military branches, along with about 40 members of its sons division and about 20 members of its ladies’ auxiliary. Located at 2006 Orthodox St., the post has had veterans of all major military conflicts dating back to World War I on its membership rolls. But the building is in need of significant improvements, according to Commander Guy D. Lewis. Members have been growing their own building fund in recent months. The state allocation will provide their ongoing efforts with a major boost.